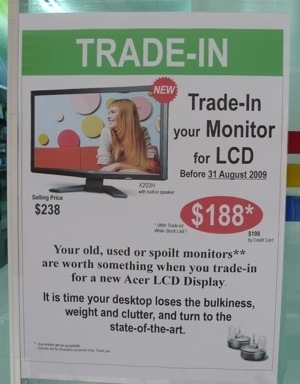 So one day I was flipping through the newspapers and I saw that Concept Computers was doing a trade in offer for old monitors to get a $50 discount on a brand new LCD monitor. So I would assume that they were going to recycle the monitors as they accepted both working and non working monitors, but I had to check with them. Actually I wanted to get the contact of the recycling center they were going to send it to. So I asked the staff there and they informed me that I should as their boss Mr Vincent Pao. He happened to be there at the shop so I approached him and asked whether they were going to recycling the monitors. He told me that he was going to throw them away!! He did mention that they would give some away but that the last time they sent quite a lot of computer equipment to be recycled they only got B$200+ from it. So he tried another method. 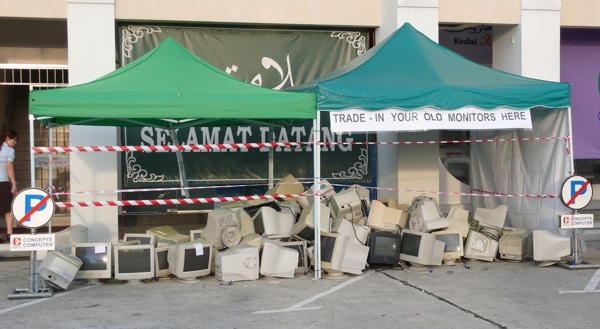 There were recyclers offering to take the monitors from him but he wanted to sell the monitors to them to at least get a better return on investment I guess. But they didn’t want to pay for them so he said they were better off throwing it away. After hearing that I thought what a bummer. I’ll go hug a tree to make up for it (actually that reminds me about the ISB‘s Million Trees Project and BIBD‘s commitment to match each tree for every 4000 bought). But at least he did mention that they were giving some away. 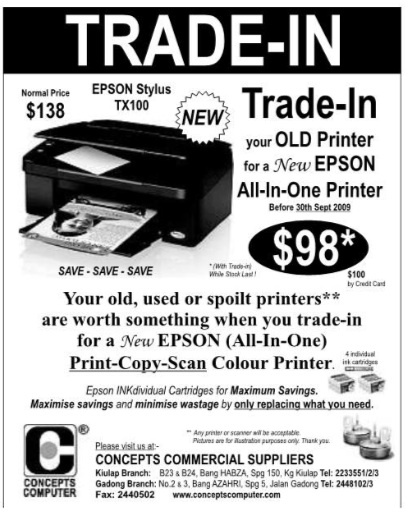 I will try to follow up on this issue as now they are having a printer/scanner trade-in: any printer/scanner for an All-In-One (Print-Copy-Scan) Epson Stylus TX100 for just B$98 available while stocks last and before 30th September. On a lighter note I have to say that Concepts Computer is the only innovating computer store in Brunei (to my knowledge), from organizing seminars on Windows 7, Panda anti-virus and now offering these trade-in offers. Other computer stores in Brunei, I hope you step up your game plan to exceed the things Concepts are doing!